The Great Western Main Line is a main line railway in the United Kingdom, corresponding to the principal routes of the pre-1948 Great Western Railway which were subsequently taken over by the Western Region of British Railways and are now operated by First Great Western. The original Great Western Main Line runs from London Paddington via Reading, Swindon, Bath, Bristol Temple Meads and Exeter to Plymouth. The route that diverges at Wootton Bassett near Swindon to Bristol Parkway, the Severn Tunnel, Newport, Cardiff and Swansea, known as the South Wales Main Line, is also part of the Great Western Main Line, as is the Berks and Hants Line, diverging at Reading to reach Exeter more directly via Newbury, Westbury and Castle Cary. 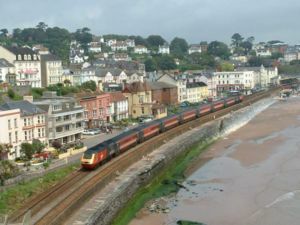 The main lines between Paddington and Bristol are capable of supporting 125mph operation, having been upgraded during the 1970s to support the introduction of the Intercity 125 (HST). The line is electrified at 25 kV AC overhead between Paddington and the junction with the line to Heathrow Airport, and is one of only two lines in the UK to be equipped with the Automatic Train Protection (ATP) system, the other being the Chiltern Main Line. Further electrufucation of the Main Line would be difficult, since the size of the Severn Tunnel is too small to fit in overhead electric lines and without an extension to South Wales there would be insufficient traffic. Privatisation of the railways has also brought rail electrification in Britain to a virtual stop. Tarka Line merges from Barnstaple, also the Okehampton stub of former West of England Main Line to Plymouth via north Dartmoor. There is also an avoiding line around the town. Note: Most direct London-Plymouth trains use this route. Note: The section of line between St Austell and Truro has recently been upgraded to double track, to allow better timekeeping and reduce delays to services. This page was last edited on 16 February 2007, at 05:18.